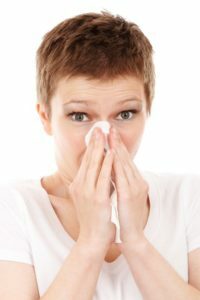 If you suffer from indoor allergies, you are definitely not alone. About 20 percent of Americans suffer from indoor allergies, resulting in watery, scratchy eyes, stuffy, runny nose, headaches, shortness of breath, and even triggering of asthma symptoms. 1 – Replace pillow covers and mattress pads. Look for allergen blocking pillow covers and mattress pads and wash all of your bedding weekly on high heat. Creating a barrier with allergen-blocking covers will stop pollen, dust, and dust mites from settling into your mattress and pillow while washing sheets will remove the allergens. 2 – Minimize clutter and think before you buy – Decluttering your home can temporarily stir up dust, but once you have minimized your “stuff,” your home will be easier to clean, which will reduce the collection of allergens. Once you have decluttered, become an allergy smart shopper – think about the ease of cleaning the items you buy. Avoid cloth surfaces and intricately detailed decor that can collect dust, opting for wood, leather, and clean lines that are easier to maintain. 3 – Upgrade your air filter – Swap out your air conditioners’ air filter with an allergen-reducing HEPA filter and be sure to replace it at least quarterly. If you choose not to use HEPA filters, you should change your filter every 30-45 days. 4 – Keep the kitchen clean – Don’t leave dirty dishes in the sink and be sure to keep drains clean. Food left out can attract pests, who harbor allergens, and dirty drains invite mold growth. Similarly, keep track of food in your pantry and refrigerator, making sure you remove any spoiled food before it goes moldy. 5 – Ditch the carpet – While this may not be the easiest thing to do, it can make a huge difference in your quality of life – remove carpet and opt for hard surfaces like wood, linoleum, and tile. If replacing the carpet is out of the question, be sure you invest in a vacuum with HEPA filtration specifically designed to contain allergens – and use it often. There are many ways you can reduce your allergen exposure in your home. However, if allergies are still giving you trouble, it’s time to make a visit to a specialist that can help. The ENTs are Palm Beach Sinus Doctors can help you find relief. Make an appointment today!